Santa Clarita Valley Sheriff’s Station deputies work to keep a child from falling through a window screen on the second floor of an apartment building in Canyon County. | Photo: Austin Dave/The Signal. Parents of a girl rescued after she was found pushing on a second-floor window screen early this month appeared in court Monday on charges of cruelty to a child that is likely to produce injury or death. The rescued girl’s parents, Lucia Romero and Gerren Mitchell, each 28, mother and father respectively, were arrested March 6 after an incident in which sheriff’s deputies and firefighters rescued the girl. When the pair appeared in San Fernando Superior Court, they were ordered to return to court on April 8, Venusse Navid, spokeswoman for the Los Angeles County District Attorney’s Office, said Tuesday. The harrowing experience began for the child on March 6 when a neighbor called the SCV Sheriff’s Station regarding the small child, saying she was suspected to be home alone and was crying and leaning on a window screen from inside an upper-level apartment, SCV sheriff’s spokeswoman Shirley Miller said at the time. Deputies were prepared to catch the young girl if the screen gave out, while others yelled up to her repeatedly to “go sit on your bed” or “step back from window,” to which the young girl was unresponsive, according to witnesses. Firefighters forced their way into the apartment and scooped up the child, who was then taken to the hospital. The child, who was home alone, was later placed in the care of social workers with the Department of Child and Family Services. 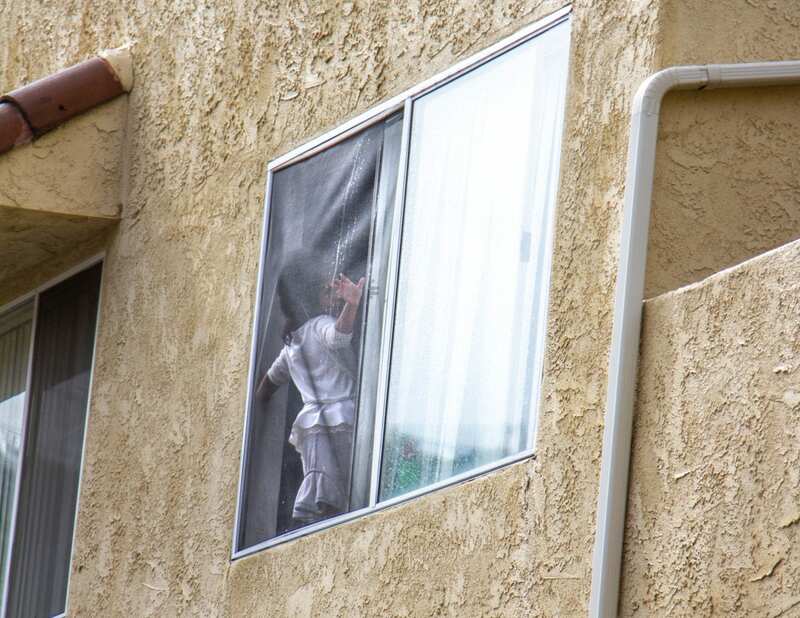 A firefighter carries a child to an ambulance after first responders worked to keep her from falling through a second-floor window on the 26700 block of Isabella Parkway in Canyon Country. The child was apparently left home alone. | Photo: Austin Dave/The Signal.